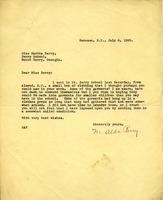 Letter to Martha Berry from M. Alda Perry informing Miss Berry that she sent some clothes to the Berry Schools. She does inform Miss Berry that some of the garments are somewhat spoiled because they had hung in a clothes press. She hope that Miss Berry doesn't think that she imposed on her but thought that the clothes that are somewhat spoiled could be cut down and made into clothes for smaller children.